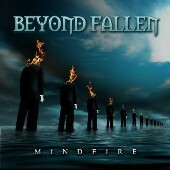 BEYOND FALLEN is another melodic heavy/power/semi-progressive American Metal band with influences - as they confess - by Metal monsters such as IRON MAIDEN, DREAM THEATER, ICED EARTH, BLACK SABBATH and JUDAS PRIEST. They play a mixture of Metal, Thrash and Progressive Metal, all wrapped under the flag of traditional heavy (mostly old-school) music. Here you can find quite nice played songs - many tempo changes which create anxiety and passion at many points. The production could have been better here and there but on the whole it is a quite nice and easily heard. There are many well played leads, which create a nice icon for the listener throughout the record. Of course this album could be accused for certain metal cliches regarding the rhythm parts or the general strong structure and approach, as they often remind you of other glorious classical metal bands but I guess that this is OK up to a point. The music flows really easily - especially if you are into more classical bands like JUDAS PRIEST but also enjoy a couple of progressive touch - like a DREAM THEATER or something. You will often find elements and parts which strongly, or not, accidentally remind you of bands in the likes of OVERKILL or ICED EARTH. I think that after a couple of listening to this album you get used to it and feel like you know what is going to follow at some points. The aggressive voice of Joe Karavis constantly attracts you and kicks you in the nuts by releasing anger and fury at the same time. They may need more time for some fresher ideas or arrangements but if you enjoy traditional approached Heavy Metal music these guys are for ya! Don't forget to listen to this CD for more than 3 times to start it revealing its secrets. Highlights of this album can be considered - amongst the others - the following ones: Blood On The Ice, Enemy of An Open Mind, The Dominance and Bomb Inside Your Head.